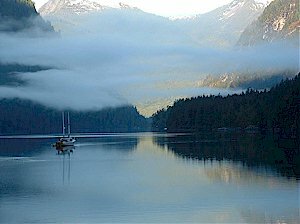 Wisps of fog often shroud the sheer granite walls of the secluded, fjord-like waterway called the Princess Louisa Inlet in southwest British Columbia northwest of Vancouver and not far, as the crow flies, from the world-class Whistler ski resort. Photo courtesy Fantasy Cruises, Inc.
A popular anchorage for sailors, yachtsmen and small cruise ships, the inlet is reached from the Strait of Georgia via the 70-mile long Jervis Inlet which probes the British Columbia mainland between Powell River and Horseshoe Bay. The 1,000-foot deep (300 meters) Princess Louisa Inlet itself is about five miles (eight kilometers) in length, no more than 1/2 mile wide (800 meters) at its broadest point and is almost completely enclosed by mountains which rise sharply from the water's edge to elevations of 7,000 feet (2,100 meters) and more. The marine park is managed by BC Parks with the cooperation of the Princess Louisa International Society. Copyright � 1997-2017 Go Northwest, LLC. All rights reserved.